Just in time for AnimeCon 2018, I have finally found out the origin of the samurai-walking-a-cat artwork, and what it’s all about! 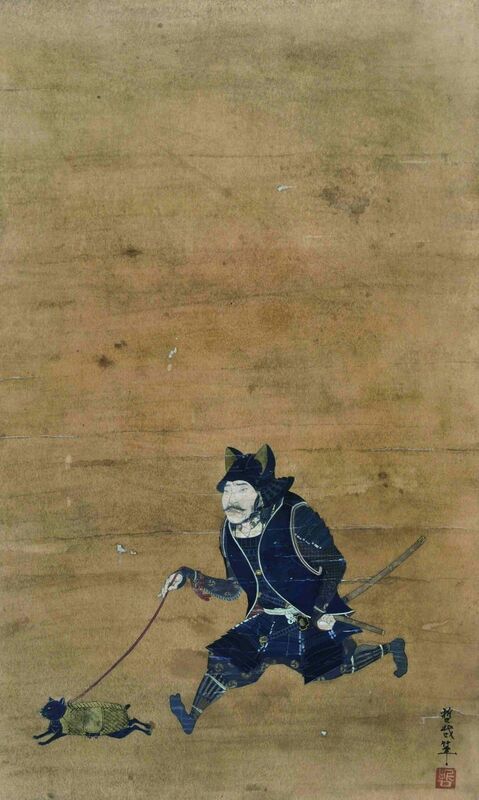 A samurai walking a cat. Thank goodness I figured out where it was from. Anyway, it turns out it’s an artwork from an exhibit by contemporary artist Tetsuya Noguchi, who specializes in insanely well executed renditions of samurai in comical and surreal situations. Here’s a blurb about the exhibit, with more examples of the art, including a samurai on a penny-farthing bicycle! Absolute respect for getting all the details dead-on accurate. There was a lot of research that went into this, in addition to the artistic skill. My favorite part is the multiple layers of humor, and the farther you look into it the funnier it is. Modern parody artwork of samurai doing something incongruous, which quotes from historical sources, some of which are themselves parody artworks of samurai doing incongruous things, or which seem incongruous out of context. Nice. A quick bit of said context so you can appreciate it all the more! 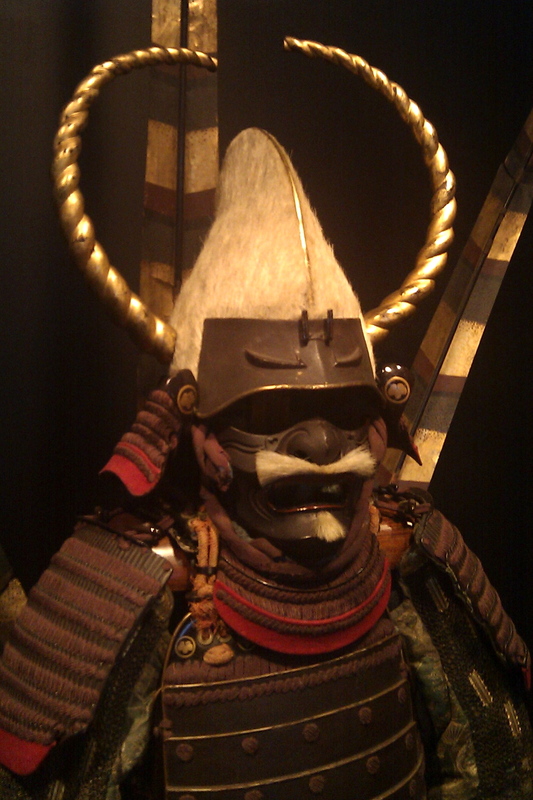 “Samurai” means, basically, “servant” so no high-class warrior would consider themselves a samurai, like some sort of ashigaru (footsoldier) prole. 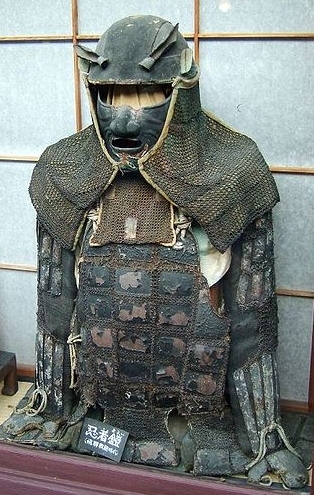 As for what to call a pre-modern Japanese warrior in general, I’m going to go with bushi (warrior), from here. Looking distinctive – Make sure your armor is unique, and instantly identifiable, so that you get properly witnessed by others on the battlefield if you do cut someone important’s head off, so you can get rewarded for it. This also serves to make sure that people know that YOU are important enough to try to cut your head off if you get killed, because it would be miserable, pointless, and horribly humiliating if you died, and nobody even bothered to harvest your noggin. This is also why you should also wear makeup and grow facial hair (high class gentleman!) if at all possible. LOTS of paperwork. This whole system of Eternal War for Fun and Profit ran on bureaucratic red tape like an old timey steam engine ran on coal. Historians love this fact. How do we know who took what heads and got which rewards? We have the hearing transcripts and the severed head receipts. Awesome. Let’s look at some historical examples! Probably late Sengoku Era, or in the style of that time, armor. Wearing a face guard so people can’t see your mustache? Just put a mustache on the face guard. Problem resolved! Probably lots of people are wearing a helmet that looks like a gentleman’s hat. Cover the hat with fur to match the mustache, and add some gilt bronze horns, for bonus distinctiveness points! Honestly, at this pace, kitty ear helmets aren’t out of the question. Here’s a rather worn example, of somewhat less fancy armor, with rabbit(?) ears. 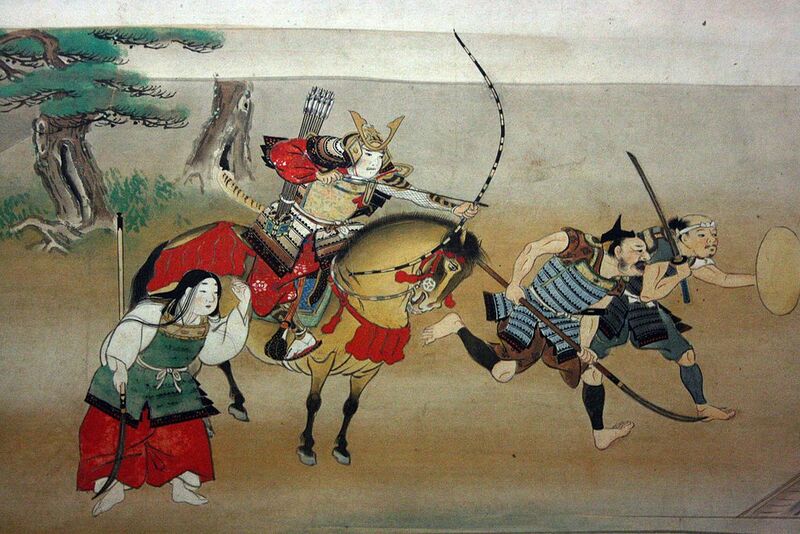 Shizuka Gozen (Yoshitsune’s girlfriend), Minamoto no Yoshitsune (on the horse), and a couple of scruffy ashigaru for contrast, in a 1500s painting. Note that they’ve apparently scrambled out of the house without shoes, but not before putting on armor and makeup. It’s all about priorities. See you guys at Anime Con, where you can Ask Me Anything! This entry was posted in Art and Inspiration and tagged anime, Animecon, art, epic rabbits, fashion, History, manga on July 25, 2018 by Katherine. 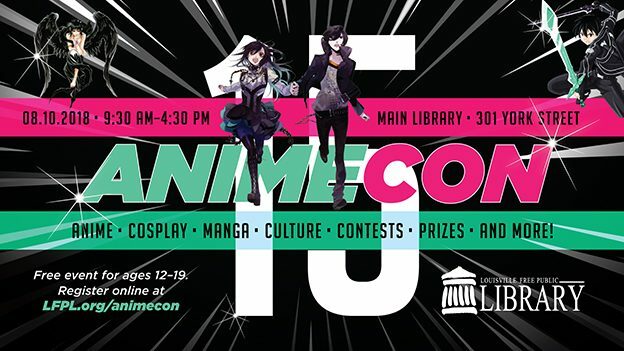 Animecon is Friday, August 10th at the Main Library from 9:30am – 4pm at the Main Library. Join your fellow fans for anime viewing and discussion, cosplay, our annual Ramen noodle eating competition, and much more! Teens (12-19) can sign up online in advance by visiting http://www.lfpl.org/tickets/animecon-registration.asp. And don’t forget to look for the full schedule (coming soon) on the LFPL website! This entry was posted in Library Programs, TV & Movies and tagged anime, Animecon, Ramen on June 19, 2018 by mk.